The Neighbourhood Forum has recently been contacted by the Eat Seasonably Campaign. Its aim is to help us enjoy fruit and veg when they are naturally at their best – better taste, better value and better for the environment. Visit http://www.eatseasonably.co.uk to find out how to make the most of what’s best this month or click on the video below. 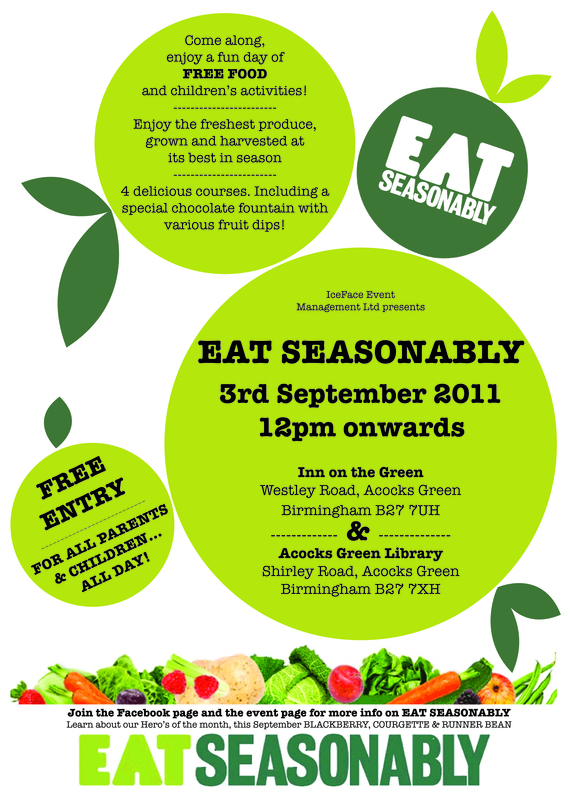 A special event to promote Eat Seasonably will take place outside Acocks Green library, and next door at the Inn on the Green on 3rd Sept from 12pm in the form of an outdoor street party. The aim to get the local community involved in learning about eating healthily, and more importantly, locally grown produce, harvested in its best season. Also, they will be serving three courses of free food for the public, cooked using the freshest and locally sourced produce in season. The organisers of the event are also looking for volunteers and children’s entertainers for the day too. Details about the campaign are on http://www.eatseasonably.co.uk, and for more info on the event day, visit their Facebook Event Page ‘Eat Seasonably’. This entry was posted in Events and tagged Acocks Green, Acocks Green Library, children's activities, cooking, Eat Seasonably, gardening, Healthy Eating, Inn on the Green, local produce, vegetables. Bookmark the permalink.